Study Writing is for students at intermediate level and above who need to develop their writing skills and write better academic essays, projects, research articles or theses. Study Writing encourages students to develop their writing strategies, seek feedback on their own writing and analyse expert writers’ texts in order to become more reflective and effective writers. 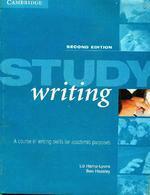 Offering practice in processes and strategies known to help learners improve their academic writing. The book contains a full answer key and helpful teaching notes. This Second Edition has been updated to reflect modern thinking in the teaching of writing, to include more recent texts in the disciplines presented and to take account of new media and the growth of on line resources.